Santorini, Greece has been one of those magical places that have been on my bucket list since for years. Santorini is the famous place where the white washed homes are tucked away in the hills where you can view the most beautiful sunsets. After being on Santorini for five days and four nights I can honestly say that it is even more beautiful in real life. From the blue domes, to bougainvillea flowers, to the most perfect sunsets - every corner of Santorini is a breathless moment and an Instagram picture worth taking. First off, let's get to know Santorini and it's beautiful towns. The most popular places in Santorini and where you will most likely stay are Fira, Firostefani, Imerovigli, or Oia. Fira is the capital of Santorini which flows into Firostefani. The next town from Firostefani is Imerovigli. The last town is Oia. There are also many more towns outside of these. To get around Santorini we rented an ATV (which our hotel dropped off at our hotel for us) and ventured out. One of our favorite towns we visited was the old town of Pyrgos. You may have also heard of the term "Caldera" which is a large depression surrounded by the walls of a volcano. Our hotel faced the Caldera which was breathtaking! Hotels can be quiet expensive but they are worth the splurge! We stayed in Firostefani at the beautiful Homeric Poems. 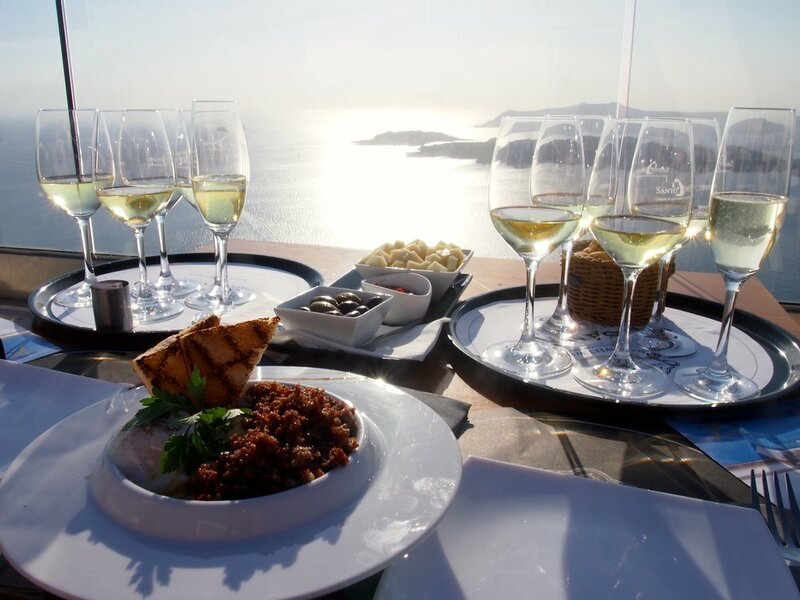 The reason we chose this location was that it is outside of the crazyness that Fira has to offer but yet it is close enough that you can walk to Fira in about 10-15 minutes. It is a beautiful hotel and there are different room options depending on what you want. Our room was gorgeous with the most beautiful view of the Caldera. The view of the sunset in the evenings was unreal. You can't go wrong with any of the places at Santorini honestly. All the food is so fresh and every single meal we had was amazing! Homeric Poems has an amazing breakfast so we ate out for lunch and dinner each day. Go on a sailing tour - Our hotel booked a sunset sailing tour which lasts 5 hours through Spiridakos with a few stops that includes snorkeling, swimming in the hot springs, and to watch the sunset. They cook you dinner and they had all the wine and beer you want. This was one of our favorite activities. Hike from Fira to Oia - This is a 7 mile hike which takes about 3 to 4 hours depending on how fast you walk from Fira to Oia. Make sure to get an early start as the sun can be strong around noon and bring water! There isn't many places to stop between Imerovigli and Oia. Rent an ATV - I think an ATV is the best way to really get to know Santorini. You can rent an ATV for about $35 Euros a day. We drove the ATV to the lighthouse and the beautiful town of Pyrgos. Walk down to Ammoundi Bay (Fisherman's Tavern) - We walked down the donkey path and had a wonderful lunch down at the bay area at Ammoundi Fish Tavern. Wineries - Santos Winery was my favorite with the most spectacular views. Watch the Sunset - The most popular place to watch the sunset is in Oia, however, we had the most amazing views of the sunset at our hotel. Take a Cooking Class - This was an activity we did not get to do but if we had an extra day this is a must-do! There are a number of beaches and they are all very different from each other. The Red Sand Beach you have to hike through the rocks to get too. The White Sand Beach is only available by water taxi. My favorite was Kamari Beach which is the only beach I saw with the most beautiful beach bars, hotels, and beach. ATV rental for the day is fairly cheap. It cost us about $35 Euros for the day. You do have to make sure to get your international permit before you go to Santorini.